NOTE : The method to stop/start http as mqm is not covered in this tutorial . Example2: Enable triggering to start a unix script with a receipt of a message . 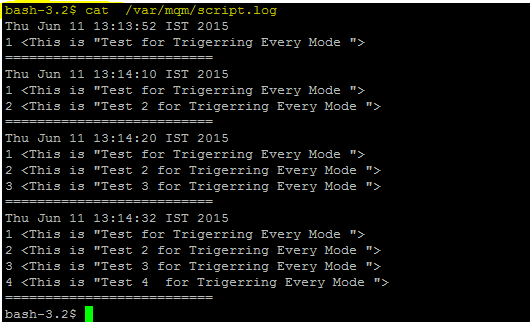 Also The script.log will let us know if it has run properly and triggering invoked. 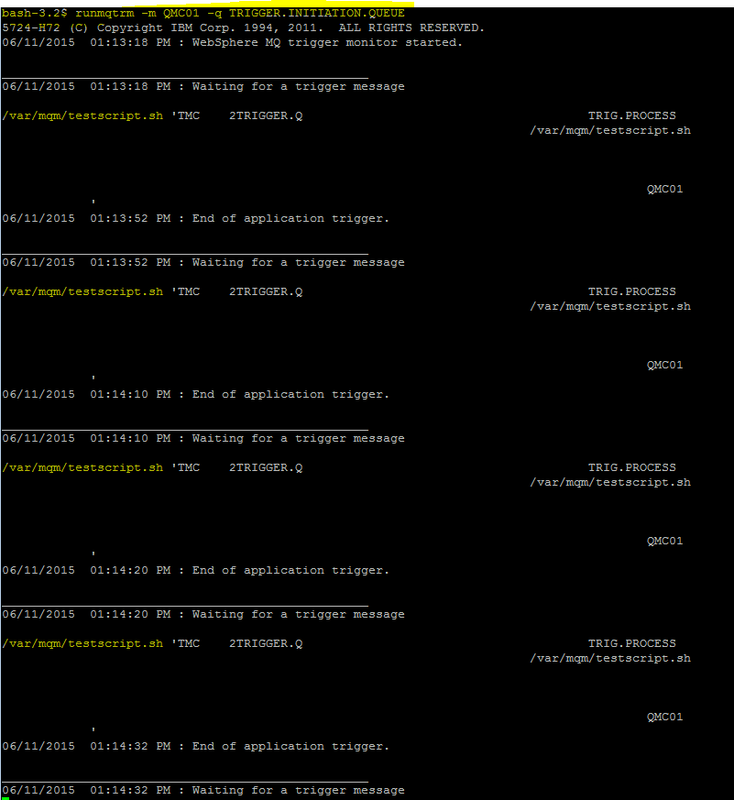 ——- After the triggering is fired the Triggering for the QUEUE “TRIGGER.Q” in the Example , It gets disabled ..
——- It needs to be Re-Enabled using below command or use MQSET to renable the TRIGERR from the Application. 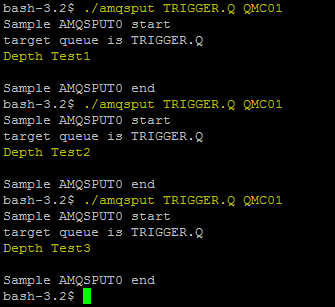 1) A message is put to a queue defined as triggered. 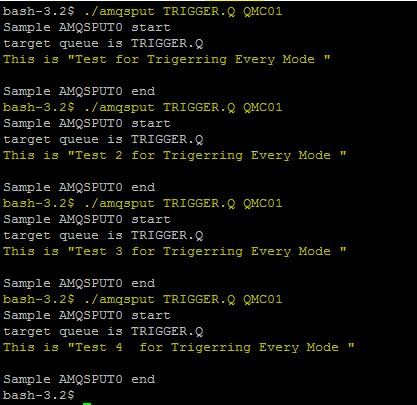 2) If a series of conditions are met, the queue manager sends a trigger message to an initiation queue. 3) This is called a trigger event. 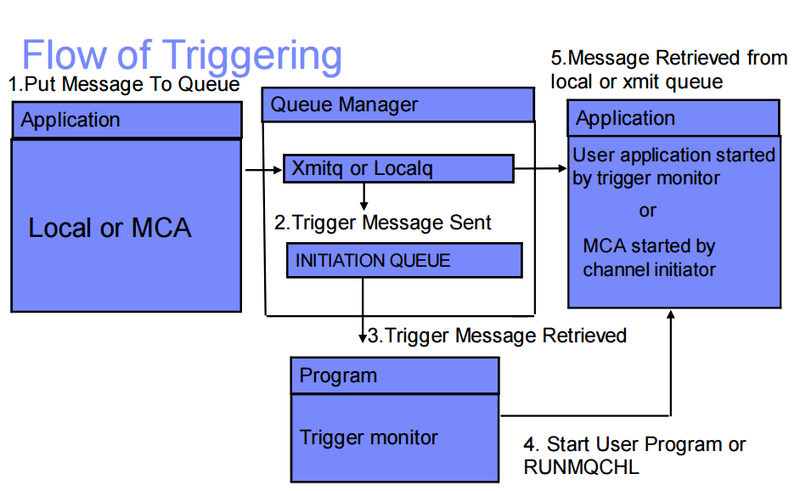 4) A trigger monitor reads the trigger message and takes the appropriate action based on the contents of the message, which is typically to start a program to process the triggered queue. a) Create an initiation queue or use the default SYSTEM.DEFAULT.INITIATION.QUEUE. b) Create a process definition. c) Create or alter a local or model queue. d) Associate the initiation queue and process definition with the local queue, and specify the trigger attributes . Now even if we put more messages in the Queue TRIGGER.Q the trigger will only happen once ( ie the First message ie when the Queue Depth goes from Zero to One . 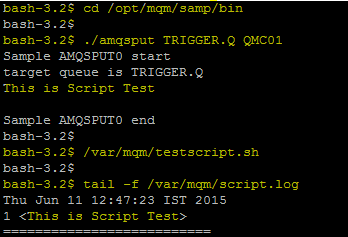 But with the runmqtrm we see that the script only ran only ONCE. Trigerring Scenario : We will Test the Trigerring method for EVERY Message instead of the FIRST message entering the Trigger queue. 03/20/2014 01:18:24 PM : WebSphere MQ trigger monitor started.